Ich hatte einen interessanten Auftrag mit einer sehr alten 4Scheiben Zahlenkombi. Nach über einer Stunde erfolglosen Manipulierens habe ich gebohrt. 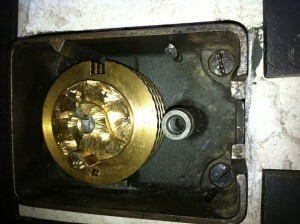 I had a very interesting job with an old S&G 4 disc combination lock. After an hour of trying to manipulate it with no good results, i decided to drill. 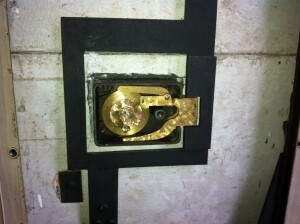 After opening the lock I understood, why I did not have any success…..
Posted in combination locks, high security locks, safelocks, safeopening, Uncategorized.